During the storm The Wife and I tried to make an apple pie. Well, we made one, all right, but our dumb asses–and I’m not assigning blame, here–forgot one whole cup of flower and the result was apple gloop. Over the weekend I tried again and yup, this time it worked, even though I undercooked it slightly so that the granny smith apples were still al dente. Now, the only trouble with making a pie for two is that, well, you’ve got a ton of pie leftover. We were both too lazy to bring it to work so I packed some of it in a plastic container and have been nibbling away ever since, diet be damned. We didn’t get much sleep last night but we were happy this morning. And you know what I had for breakfast as I watched the election results? 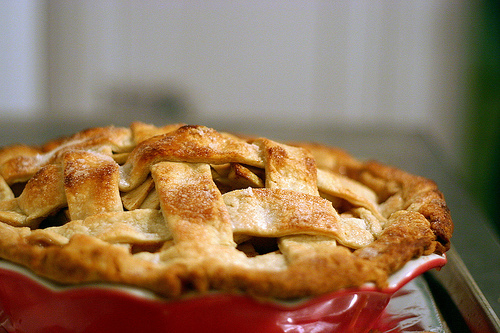 Yo got that right: All-American Apple Pie.